Our current members box is a bottle of the exquisite Jensen’s Bermondsey Dry Gin. Plus our very own Gin Journal, and as a special thanks for new subscribers, a gift set worth $161. 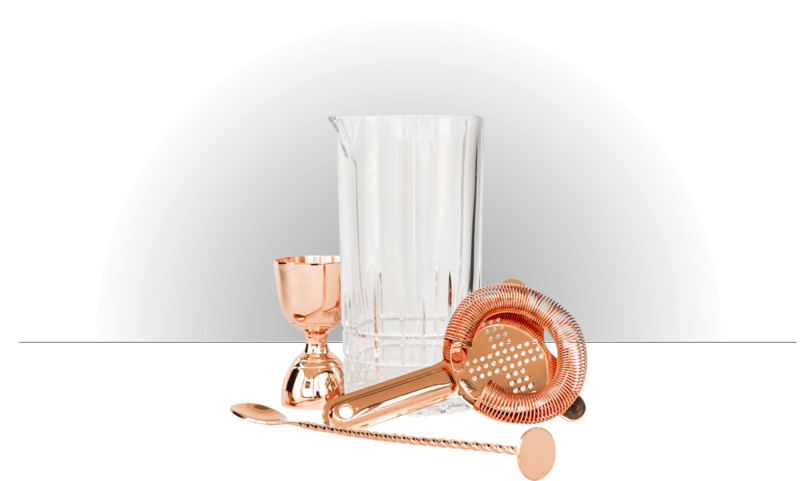 This beautiful Barware pack includes a Spiegelau perfect serve large crystal mixing glass, a copper bar spoon, a copper Hawthorne strainer and a bell copper bell jigger. 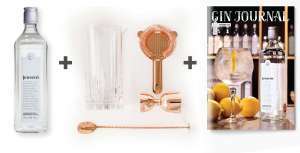 It’s the perfect kit for making cocktails with each of the special gins heading your way! Every 2 months, Gin Society members will receive a carefully selected bottle of exquisite small batch artisan gin from a different region of the world. Our bi-monthly members box will also include the Gin Journal, our beautiful magazine which provides a rich and insightful guide to the gin. As a member of the Gin Society you will be invited to attend tasting nights, industry events and the Gin Society’s Summer Ball. Our hand packed members boxes are dispatched the day after billing. Members receive tracking alerts via email and sms. On the odd chance that you may wish to cancel, you can do so anytime. Membership to Gin Society comes with no strings attached. To welcome you as a member, your first delivery includes a beautiful bar ware gift pack to help you become the grandest of cocktail makers. To say thanks for joining the Gin Society, we’re giving all our new members a special gift set – a Spiegelau perfect serve large crystal mixing glass, a copper bar spoon, a copper Hawthorne strainer and a copper bell jigger. It’s the perfect kit for making cocktails with each of the special gins heading your way every 2 months!